Sign up to win The Traveler! The Traveler, by BEAUTY & THE BOX, is a patented, revolutionary solution for organizing and using your cosmetics while traveling. 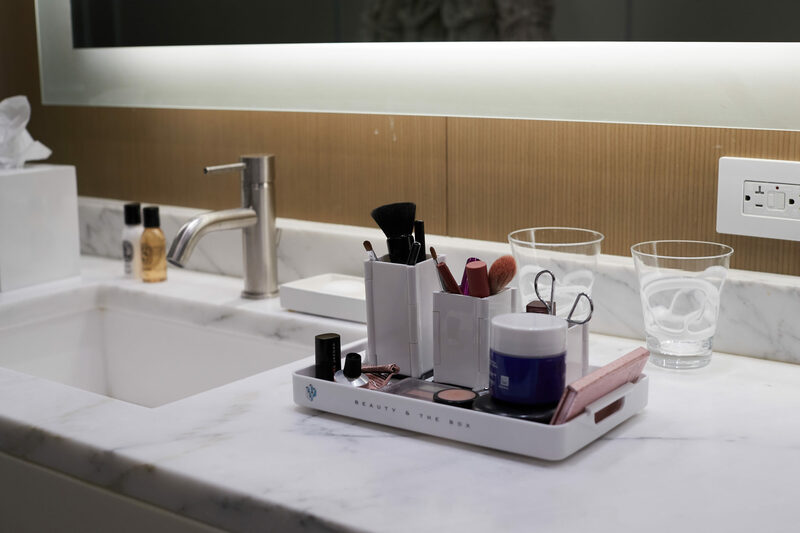 Gone are the days of messy hotel bathrooms littered with toiletries and makeup, or unnecessary time spent digging around for your mascara or that perfect shade of lipstick. The Traveler features three pop-up boxes that easily connect to a removable carrying tray, so you can vertically store all of your cosmetics in an organized fashion while traveling. The Traveler also comes equipped with a stand-alone mirror, so no matter where you are, you can always look put together and ready to go. Sign up for your chance to win The Traveler! Sign up by clicking the button below, then share this contest and refer your friends to earn more entries. The winners will be chosen at random at the end of the contest— the more entries you earn, the more likely you are to win. Good luck! 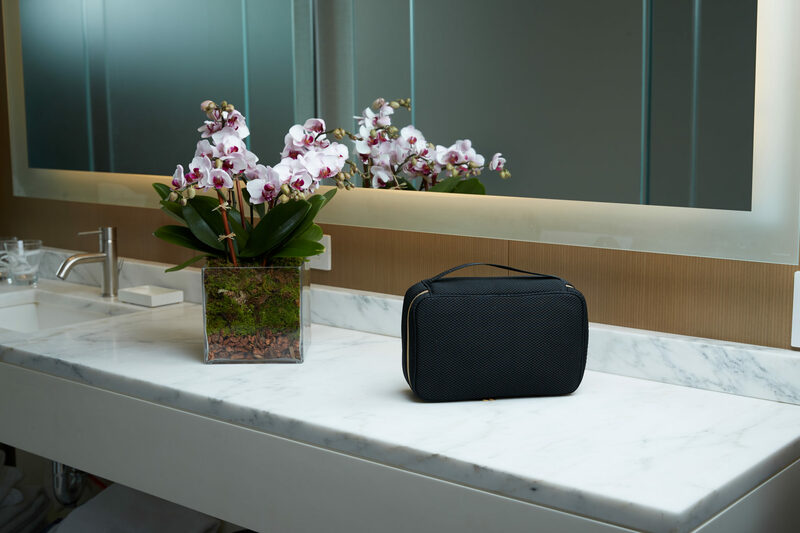 The Traveler’s chic black carrying case holds three pop-up boxes, a carry tray, a stand-alone mirror and cosmetic pouch, all in one compact case with a heavy duty gold zipper and carrying handle. It’s soft, yet durable, and tucks neatly away into your purse, gym bag or suitcase. The Traveler’s three collapsible beauty boxes come in a protective pouch and pop up in an instant to hold your cosmetics and makeup brushes upright when you arrive at your destination. Each box is a different size: tall (4”), medium (3”) and short (2”), and they’re fit to hold an array of items such as pencils, brushes and lipsticks. The Traveler’s carry tray, equipped with handles, holds all three pop-up boxes and serves as a tray for other makeup items as well. Connector holes in the bottom ensure the pop-up boxes stand sturdily upright, even while holding a beauty lover’s many accessories. Although the carry tray is removable, it tucks perfectly away into the carry case whether or not it’s in use. 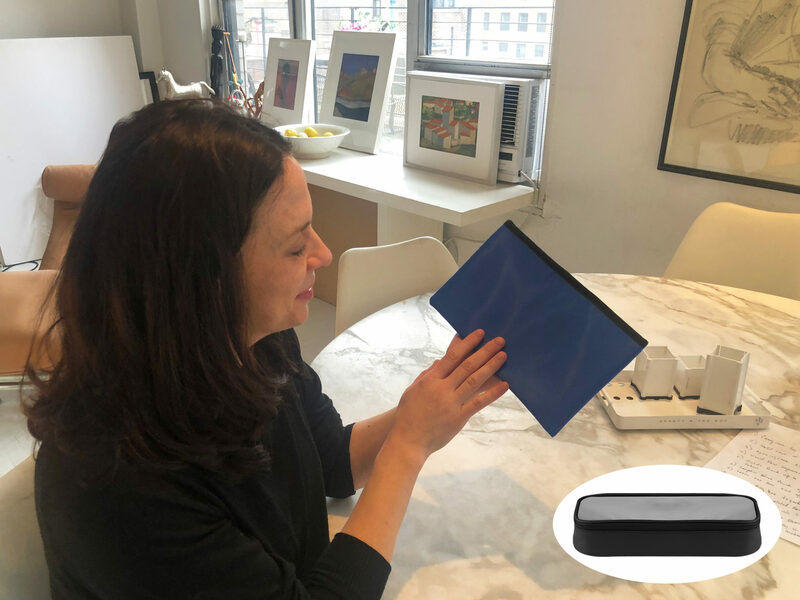 The Traveler features a stand-alone mirror, which comes in a protective pouch, props itself up so you can get ready and look put together in any situation (even when that hotel room doesn’t have a mirror in a convenient place). The Traveler’s soft, blue protective pouches house the mirror and pop up boxes when not in use. The Traveler also includes a black pouch with a clear acrylic top to store your cosmetics while traveling. Sign up to win amazing prizes by joining our VIP community!